This procedure covers the general guidelines for modifications that involve cutting and lifting component leads. Leads may be permanently cut or lifted due to engineering changes, or reconnected if done for testing purposes. Unique mixing sticks have a paddle shape on one and sharp pick on the opposite end. Figure 2: Specially designed cutters used to cut component leads. Figure 3: Place the cutter at the mid point in the lead and snip through to cut the lead. Figure 4: To ensure that the lead has been severed, the upper portion of the lead may be slightly lifted using a pick. Figure 5: If needed, solder both halves of the severed lead together. Figure 6: Place the cutter at the mid point in the lead and snip through to cut the lead. Figure 7: To ensure that the lead has been severed, the upper portion of the lead may be slightly lifted using a pick. Figure 8: If needed, solder both halves of the severed lead together. Figure 9: Gently place a pick behind the component lead to be lifted. Apply a soldering iron tip to the foot of the component lead. Apply slight force with the pick to lift the lead as the soldering iron reflows the joint. Figure 10: Visually inspect, or electrically test, to ensure that the lead has been lifted. 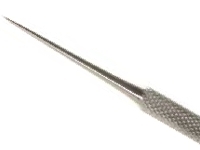 Figure 11: Gently place a pick behind the component lead to be lifted. Apply a soldering iron tip to the foot of the component lead. Apply slight force with the pick to lift the lead as the soldering iron reflows the joint. Figure 12: Visually inspect, or electrically test, to ensure that the lead has been lifted. Specially designed cutters are required when cutting component leads. Select the component lead that needs to be cut and place the cutter in position. (See Figure 3) Place the cutter at the mid point in the lead and snip through to cut the lead. To ensure that the lead has been severed, the upper portion of the lead may be slightly lifted using a pick. Visually inspect, or electrically test, to ensure that the lead has been severed. If the lead needs to be reconnected, gently push the upper portion of the severed lead down until it touches the lower portion of the severed lead. The lower portion of the lead may move during soldering since it is not anchored in position. If required, clean the flux residue and inspect. Select the component lead that needs to be cut and place the cutter in position. (See Figure 6) Place the cutter at the mid point in the lead and snip through to cut the lead. To ensure that the lead has been severed, the upper portion of the lead may be slightly lifted using a pick. (See Figure 7) Visually inspect, or electrically test, to ensure that the lead has been severed. Select the component lead that needs to be lifted. Apply a soldering iron and solder braid to remove the excess solder from the joint. If the lead needs to be reconnected, gently push the lead down until it touches the pad and solder.